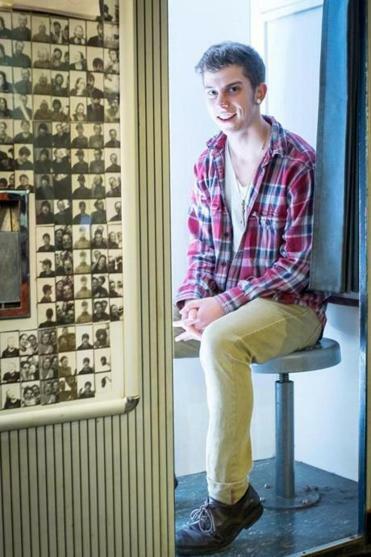 Skylar Kergil, at the Diesel Cafe in Somerville’s Davis Square, is an advocate for transgender young people. On the first day, Skylar Kergil turned on the webcam and gazed into it, seeing a familiar digital reflection — the smooth cheeks, a crest of brown hair eclipsing one eye. The doctor had shown Kergil, 17, how to inject testosterone — the first step in changing the female body he was born with to male. The hormone had been in his system for only an hour, but Kergil’s voice was full of wonder. “So today’s my first day being born, I guess,” he said. Kergil was recording himself, especially the depth of his voice, hoping to document his physical progression. It was 2009, and he uploaded his videos to YouTube when he ran out of computer memory. He didn’t expect anyone to watch what would become his video blog. But soon viewers of all identities and orientations discovered Kergil’s journey. Now, nearly six years later, Kergil lives in Cambridge and has more than 61,000 YouTube subscribers. His 191 videos have been watched nearly 6 million times. Thousands of people from around the world have written to cheer him on, and seek advice. Earlier this month, he flew to Los Angeles, where the Trevor Project, a national group that works to prevent suicide among gay, lesbian, bisexual, transgender, and other young people, awarded Kergil its prestigious Youth Innovator Award. But back on Jan. 21, 2009, Kergil was just a high school senior, sitting in his Acton bedroom, a Red Hot Chili Peppers poster and his guitar behind him. He spoke with the voice of a teenage girl. He had persuaded his parents to let him start taking testosterone before he began college. 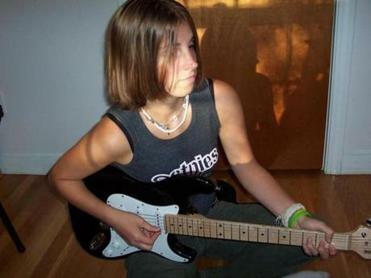 Skylar Kergil, playing the guitar in 2005 at home in Acton, began his transgender journey in January 2009. As Kergil got older, he remained a tomboy, loved sports, and secretly was elated when he was mistaken for a boy. In eighth and ninth grades, he tried to fit in with girls. He wore tighter shirts, grew his hair longer, and dated boys. “I realized about halfway through freshman year that I felt so fake, and I felt so uncomfortable,” he said. So he stopped. He began dating a woman. Hanging out with the school’s lesbian crowd helped — he saw another path for women, one that was less stereotypically feminine. He cut his hair short and began wearing baggy clothes. But he didn’t fit in there, either. Everything changed when he was 15, a sophomore. At a concert in Worcester, he began talking with a man in the crowd. The man told Kergil that he was born female. He was transgender, six months on hormones. It was the briefest of conversations, but it was all Kergil needed to make sense of his inner dissonance. He knew immediately that transgender described him. Even better, he saw a way to align his body with his mind. He approached his family gently, telling them he was questioning his gender and asked to visit a gender therapist. His parents, who were divorced, agreed. In the summer before his junior year of high school, he decided to change his name to gender-neutral “Skye,” and asked others to describe him with male pronouns. He remembers that his mother cried. He knows now that she was grieving the loss of a daughter and also that she worried about him. But 16-year-old Skye felt like she wasn’t supporting him. His mother, Stephanie Tyler, told her son she would love him no matter what, but she knew so little about being transgender. Still, she began to glimpse his unhappiness. Tyler balked at first at the idea of testosterone injections, wanting her son to be older before he physically altered his body. But Kergil convinced her that he wanted to begin Skidmore College as a man. That year, 2009, Tyler announced in the annual Christmas letter that she now had two sons. Kergil’s videos documented his body’s second puberty: His voice deepened and hair sprouted on his chest and stomach. His muscles bulked up. His Adam’s apple thickened. Some people who followed his YouTube channel wrote nasty messages, others cheered him on. “Your videos were the first thing to make me realize I wasn’t the only one,” someone wrote recently. One of the most common questions from transgender teenagers was: My parents aren’t supportive. How can I get them on my side? After Kergil made a video Q&A with his mother, she agreed to e-mail transgender children and their parents to talk about her experience. She got hundreds of requests. In the early days, Kergil never gave his full name or told viewers where he lived. When Kergil went to LA to accept his Trevor Project award, he took his mother with him as his plus-one. Some transgender people say they see themselves as two beings: the person they were born, and the person they became. Kergil said he felt that way for a while, as if he had murdered his twin sister. Now he feels like one person who changed along the way. Yet, he knows he is still evolving. Kathleen Burge can be reached at kathleen.burge@globe.com. Follow her on Twitter @KathleenBurge.